I began my journey with RBB Systems in the summer of 2010. My first home was in the stockroom prepping components and pulling orders for the many different jobs that came through the shop. The one thing I learned very quickly was that no two jobs were the same and the customers were ever changing – benefits to being a small batch electronics manufacturing experts. This was my first experience with this type of work environment. Previously it was mass production. Same parts, same customers. But this was something new that I had never dealt with: many different parts and many different customers. I learned as much as I could and quickly fell into the groove of custom electronic assemblies. I familiarized myself with the different customers, unique jobs and special care that had to be given to each job I worked on. Things were rarely the same twice, so attention to detail was a must. I was in the break room one afternoon and saw a job posting for a Customer Liaison position. I was very excited to apply for the job because I could utilize my office and customer service skills from the previous jobs I had held. After a few interviews, I had the position and couldn’t be happier. At first, it was very overwhelming. As a member of the Sales team, I dealt with all of our customers. All of the incoming quote efforts and all of our different electronics manufacturing assemblies. There was a lot of information to grasp, especially when we had 795 unique circuit board assemblies to work with that year. About four months into my new sales career, RBB decided to switch up our game plan. We formed three Customer Centric Teams. 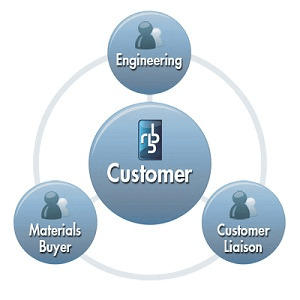 Each team consists of a Customer Liaison, a buyer/planner and an engineer. The customer base was split amongst the three teams. Each team was now responsible for a certain batch of customers. This helped me tremendously. I was now a part of a team that was exclusively devoted to a customer list. 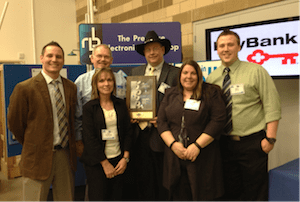 This not only helped RBB grasp our wide array of customer needs, but it also impacted our customers in a positive way as well. We sit together. We talk openly about any issues or problems that arise with our customers and brainstorm ways to solve them. We learn from each other on a daily basis and address each customer’s needs promptly and effectively. We function as a single unit and help each other to service our customer's needs. We keep their electronics manufacturing projects flowing smoothly and quickly through the shop. New prospects are assigned to one of the three teams and are instantly inserted into the process. RBB is a tight knit family, so in the instance a team member is ill or on vacation, the wheels still turn. Members from other teams step in and make sure that things get done. My home is now with Customer Centric Team C (CCT-C). Although I am still a part of the Sales Team, I am also the Customer Liaison for my team. Since implementing the new structure, we have been able to communicate on a more personal level with our customers. We have a better understanding of their needs. 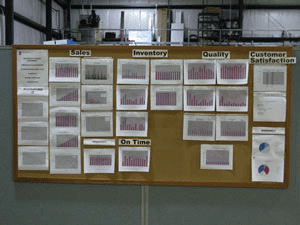 In working more closely with them, we have been able to cut our production lead times. We have engineering and documentation issues clarified within a few days instead of weeks. We have trust and understanding which are the keys to any relationship. We work together to accomplish goals that we create together. The RBB mission is: “We exist to move heaven and earth to get our small batch customers what they need, when they need it.” Customer Centric Teams are just another way that RBB continues to do that. Want to learn more about CCT's? 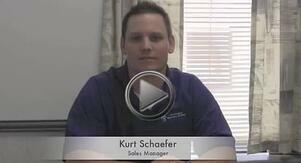 Check out Sales Manager, Kurt Schaefer's YouTube video that explains more! RBB welcomed Dani in 2010 as Materials Specialist. In 2011 she joined the Sales Team where she helps develop pricing quotes and manages related project information for customers. In her free time, Dani enjoys being a performing singer/songwriter.